The botched-Israeli commando operation which murdered children and took the lives of the innocent spawned a near-war scenario in Gaza, and now Gaza Freedom Fighters are announcing a cease-fire deal to prevent more bloodshed. "Egyptian efforts have been able to stabilize the ceasefire," Gaza's militant groups said in a statement. 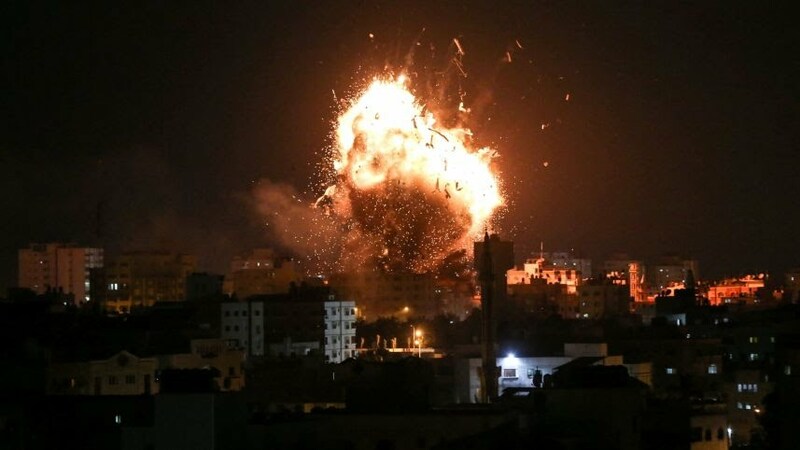 The Israeli Defense Force said more than 160 “targets in Gaza” had been hit including a Hamas government building and a television station, infuriating independent human rights groups. With three wars having been fought in the last ten years alone, a fourth looms amidst the violence, despite a ceasefire temporarily halting the bloodshed. The ceasefire was already in place prior to Israel's tyrannical violation of the agreement. <i>The tyranny of the Israeli military and its fanatical and racist behavior against the people of Palestine</i> has launched a global condemnation, with the Israelis targeting the innocent. The Al-Aqsa TV station in the Gaza Strip was bombed by an Israeli Air Strike, in a stunning display of possible violations of the Geneva Conventions. Amnesty International said any similar bombing could be a breach of the Geneva Conventions. "The bombing of a television station, simply because it is being used for the purposes of propaganda, cannot be condoned. It is a civilian object, and thus protected under international humanitarian law," it said. "To justify such an attack, coalition forces would have to show that the TV station was being used for military purposes and that the attack properly balanced the concrete and direct military advantage anticipated with the incidental risk to civilian life", said Claudio Cordone, Amnesty's Director for International Law. Turkish President Recep Tayyip Erdogan has hit Israel with repeated verbal attacks, accusing it of “tyranny” in the wake of the violent attacks along the Gaza Strip. Relations between Israeli government leaders and that of Turkey continue to heat up, with the revelations from Edward Snowden that Israel played a role in the murder of Khashoggi. 18 Saudis are currently held as Suspects in Khashoggi’s death, with Turkish President Recep Tayyip Erdogan firmly backing the idea that Saudi and Israeli intelligence is responsible. Saudis are now well-armed, with increasing pressures from the United Nations against after <a href="https://www.theguardian.com/world/2018/aug/09/dozens-dead-in-yemen-as-bus-carrying-children-hit-by-airstrike-icrc"> 29 children </a>were murdered in Saudi-led strikes. “Thousands have died, mostly at the hands of the Saudi-led forces we are arming; millions have been displaced, and the country has been left on the verge of famine,” says Owen Jones of the Palestinian genocide occurring. “You will never silence us, nor the hundreds of thousands of Israelis who reject a present founded on supremacy and oppression and stand for a future built on equality, freedom, and human rights,” B’Tselem’s director Hagai El-Ad said to Israeli Prime Minister Benjamin Netanyahu. The BDS Movement continues to grow its prowess among the support of global nations, with Ireland recently calling for an arms embargo to Israel. “As the BDS Movement grows, the amount of spam on the internet opposing the BDS movement has grown <i>exponentially</i>,” The Goldwater’s Jim Cheney explained. The slaughter continues today, and it's being done with American taxpayer dollars. End the violence. End the madness. End all foreign aid. Lets see the GAZA Pallies (Islamic terrorists) launch a bunch of rockets and immediately call a cease fire. as Israel is already busy retaliating, by erasing the launch sites with their own rockets and artillery. Isn't that like shooting up a crowd as a ISIS terrorist, then converting to Christianity? In bets of a UN-Conversion in a few weeks/months? Look the Pallies have been pulling this media stunt / trick for 30+ years. In the past these cease fires are usually followed by a major terrorist attack in a hotel, a bus full of kids, market place, crowded street and etc… in the coming weeks/months as security become relaxed.